This large 6m x 3m workshop comes with 15 years warranty and Fasttrak assembly system. Engineered for non-cyclonic conditions N3 and can be upgraded to cyclonic C2. 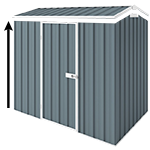 The colour YardPro ECO Plus 2010 Workshop shed is the ideal storage solution if you are looking for an affordable but strong steel workshop.